Adkins Arboretum's 400 acres of woodlands, meadows, wetlands, and gardens offer visitors a beautiful setting in which to enjoy the Eastern Shore's native landscape. Walk, jog, bike, and view birds and wildlife in these diverse habitats. The gardens display plants native to the Mid-Atlantic coastal plain in combinations designed to inspire the home gardener. Native shrubs, grasses, vines, ferns, and flowering perennials provide interest throughout the year with their ornamental flowers, fruit, and bark. The Arboretum's native gardens border a restored one-acre wetland adjacent to the Arboretum Visitor's Center, which is teeming with wildlife. Spring peepers, green frogs, and bullfrogs call to visitors entering the Visitor's Center. Arboretum Paths: Five miles of paths wind through the Arboretum grounds. The Blockston Branch path offers a walk through mature bottomland hardwood forest and is handicap accessible. 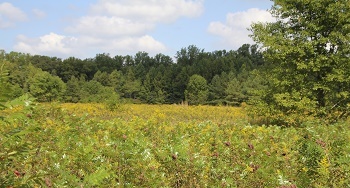 Paths lead around the Arboretum's meadows, where many creatures, including quail, bluebirds, deer, fox, and turkeys, forage for food. A mix of mature upland and bottomland hardwood forests and younger pine forests provide a rich habitat for flora and fauna. Thickets of native azaleas and mountain laurel bloom in May, and woodland wildflowers bloom from late winter to summer. Look for wood ducks and beaver along Tuckahoe Creek and Piney Branch. The Arboretum's Tuckahoe Valley trail connects to Tuckahoe State Park's trail system for longer hikes. Please view or print the map of Arboretum paths.